Finally, after the whole rumoured specs and leaked images, HMD has officially unveiled the Nokia 7.1. This is the successor to last year's Nokia 7 with a larger display, a more powerful processor and a slightly larger battery capacity. The Nokia 7.1 sports a 5.84-inch notched IPS display with a resolution of 1080 X 2280 pixels. The device also runs on Android 8.1 Oreo which is part of the Android One program. It is expected to receive the Android 9 Pie update by November of this year followed by a 2-year-worth of major updates and 3 years of monthly security patches. 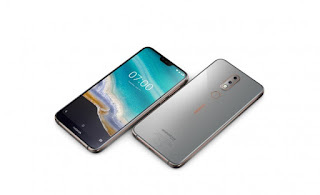 The phone is powered by Qualcomm's midrange Snapdragon 636 chipset with 18GHz Octa-core processor coupled with an either 3GB or 4GB RAM as well as a 32GB or 64GB of internal storage respectively. Both versions can be expanded via the MicroSD card slot with up to 400GB SD card. In terms of camera, the Nokia 7.1 has a dual rear camera setup with a main 12-megapixel sensor with f/1.8, 1.28-micron and a secondary 5-megapixel with f/2.4, 1.12-micron for black and white photos. In the front, the phone comes with an 8MP f/2.0 single shooter with support for AI-enhanced face unlock. The Nokia 7.1 supports dual SIM dual standby mode and it packs a 3060mAh battery with USB type C connector with quick charge support. According to Nokia, this will get you from 0% to 50% in just 30 minutes. As far as the pricing goes, the Nokia 7.1 with 3GB/32GB configuration will start at €319 ($349), while the 4GB/64GB version will go on sale for €349. Shipment of the device will start on the 28th of October this year.